Shed #3 was removed a couple of weeks ago. It was a big shed – twice the size of the others – and it took all day to remove all but the base. 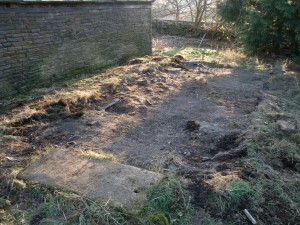 This base is just behind the outbuilding and tomorrow the plan is to strip the roof therefore it needs to go. 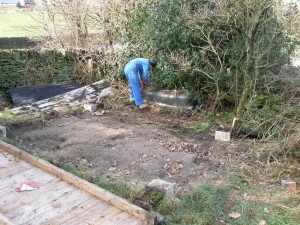 The plan was to remove the base in the morning and then spend the rest of the day dry stone walling. The weather was lovely today, particularly in the afternoon. Even sunshine! 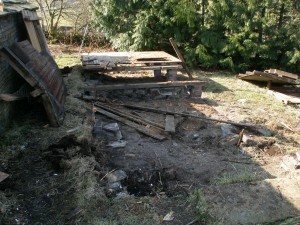 However, it took all day to remove the shed base. I can’t believe that it took so long. However, when you look at the bonfire (remember this was only burnt down yesterday), you realise exactly how much wood there was left in the base. I didn’t get time to set the bonfire, so that will have to wait until another day. After all the progress made previously, yesterday was a frustratingly slow day. It was really a day full of “tidying up loose ends”. With no power to the gas boiler, it was time to drain the heating so that we can remove the radiators and associated pipework. There is a gas fake log fire in the kitchen and this still works so at least there is some heat. It does take long to drain the heating and, not surprisingly, the fluid is amazingly black. Now the job is to remove the pipework from upstairs. The floor here is proper floorboards rather than chipboard like next door. It takes a bit longer to take the boards up and cut out the pipework. Some of this will be easier to remove when we take the ceiling down in underneath. As we have removed all of the partitions upstairs, there is a lot timber that needs to got rid of. We tend to burn the wood frequently, otherwise the bonfire is just too big. While the fire is burning, I do some odd jobs around the place: removing one of the satellite dishes, taking down some of the old plastic waste pipes and removing disused wiring from the front of the building. All jobs that need to be done, but nothing that you can really look at at the end of the day and think “Wow, that is a job well done”. Ho hum. Maybe tomorrow will be different. Day 2 of stripping out the larger cottage. 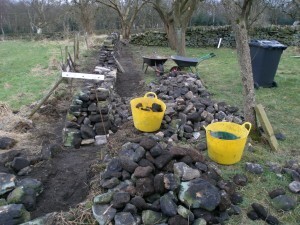 I was going to work on the dry stone wall, but rain soon put an end to that idea. So inside working is the order of the day. Today it was all about removing the bathroom and partitions upstairs. We are getting quite good at this now. By the end of the day, the upstairs are cleared out. This cottage is much nearer to the skip and this makes life a lot easier (not to mention much quicker). With work now starting on the larger of the two cottages, we simply can’t turn the electricity off as we did in the other cottage. Otherwise, we would have now electricity on site at all. The solution is to fix a single temporary socket in each of the cottages. The socket is right next to the meter so that there is no danger that you can accidentally cut through the cable as it is only 20cms long. This will provide us with the opportunity to power lights, kettles, or the occasional cement mixer. This is definitely a job for a qualified electrician and we were lucky enough to find someone locally that was available same day! It only took an hour or so! Thank you Dave! With the smaller cottage all but bare, it is time to start turning our attention to the larger of the two cottages. As we are still using the kitchen for making cups of tea, we will leave this til last. First things to go are to remove all of the doors. These are solid pine and our initial thoughts were to put them on eBay, but frankly they are all odd sizes and unlikely to fit anyone else’s house. I removed all the brass fittings (for scrap) but unfortunately, the doors are destined for the bonfire. Next came the carpets up the staircase and on the landing. Then the bathroom. 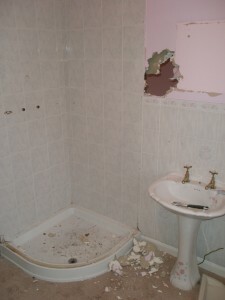 Shower cubicle was quickly removed and then onto the other fixings. The water is turned off here, but the electric is still on. To be able to proceed with the stripping out much further will require the electric to be turned off, but then this will mean no electric on site. Therefore the next job is to get a temporary spur set up off the meter, so that we have one live socket in each house, but the rest of the electric is turned off. This is a job for a proper electrician! 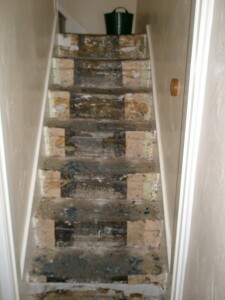 With the carpet and the underlay removed, you can see the original stone staircase. The edges have been painted (many times) as there would have be a narrow “stair carpet” that would have run up the middle. The only thing left of the shower cubicle is the shower tray. The wall behind the sink is a partition wall, however the electrics need to be sorted out (i.e. turned off) before we do too much stripping out here. Well, the weather has improved enough for us to be outdoors. It was hovering just above freezing, but it didn’t notice too much as long as you kept moving! We are still working on the wall in the orchard and are now using some of the stone that has been removed during the renovation. Since the one side of the wall is higher than the other, the first five courses on the orchard side are actually underground. This means that there is an opportunity to use any old stone in these courses as they won’t be seen. This provides the opportunity to get rid of some of the stone that has been removed while renovating the smaller cottage. This consists of concrete blocks, old bricks and the occasional patio slab. This is quicker to lay as the material is more uniform and has flatter edges. This feels like a bit of a “cheat”, but since the material can’t been seen and it saves the stone for the rest of the wall, I can’t see why not. 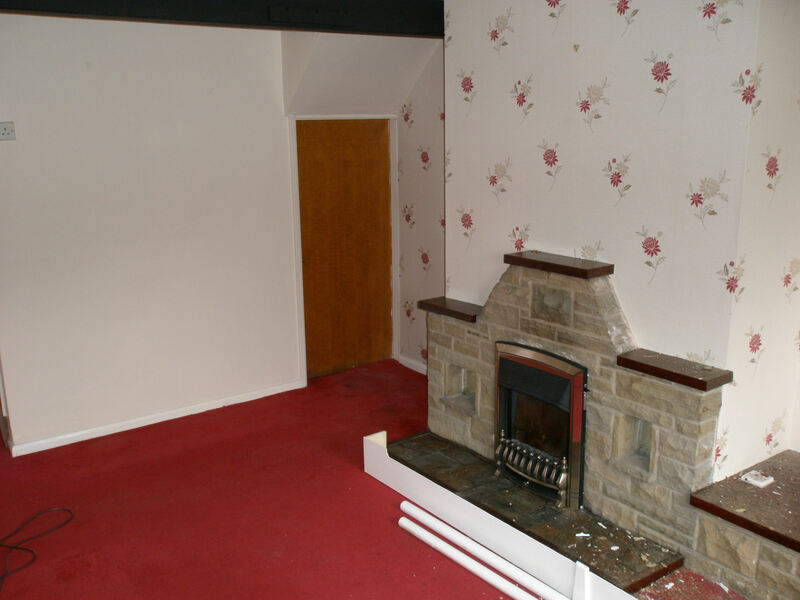 We did remove some stone that made up the rather awful 1970’s fireplace in the smaller cottage. This roughly matches some of the stone in the wall, so we have decide to use this. It will be seen, but as long as none of the machined edges face out on the wall, I think they will blend in OK, particularly once they have weathered a bit. Now we have removed the shed in the corner and some of the undergrowth, people who drive by can see us working on the wall. This has led to numerous cryptic comments in the local pub. Still working in the orchard. You can just some a couple of pale grey bricks hidden at the bottom of the right hand side of the wall. The first 5 courses on this side are hidden underground since this provides an opportunity to get rid of some of the material that we have removed. With the last of the sheds gone from the orchard, we can now start to clear out the last patch of the orchard. This is the triangular piece of land furthest away from the house. It had become overgrown with holly as was as a very old (and largely rotten) alder tree. The chainsaw and a set of croppers soon had this area cleared out. 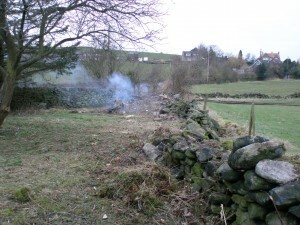 The brambles that had grown throughout the dry stone wall were particularly time-consuming to remove. 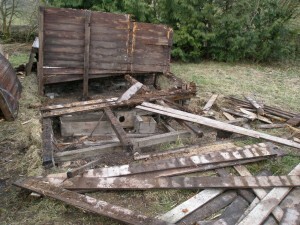 The larger pieces of timber were cut into logs, the rest was put onto a bonfire on the site of the old shed. 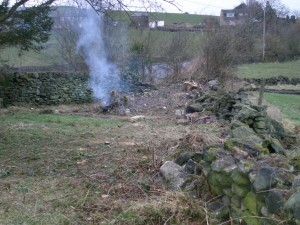 It took most of the day to clear out this area, but now we can start to see the state of the dry stone. Despite it’s condition, you can see that the it was never really straight! We will rectify this as it gets rebuilt. 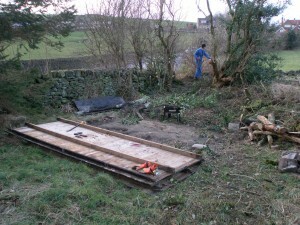 With all of the undergrowth gone, it will be much easier to mark out the position of the new wall. With all the work on the smaller cottage, we removed quite a bit of old wire and copper pipe. All in all, there were 3 rubble bags of copper and 2 bags of wire. I took these to the scrap merchant today, along with a kitchen sink and a mixer tap. Total value £117. Much more than I thought. Looking at the receipt, it looks like I got around £30 for each of the rubble sacks of copper and £10 for each sack of electrical wire (with the plastic casing still left on, but any plugs or junction boxes removed). I have gotten into the habit of sharpening the chain on the chainsaw every time I fill it up with petrol. However, on the last couple of occasions, the chain hasn’t stayed sharp for very long. You can tell from the sawdust that it produces – it more resembles dust rather than the long wood chips that are normally produced with a sharp chainsaw. On the basis that it wasn’t holding it’s sharpness, I have bought a new chain. I can fit it myself and a new one only cost £10 on eBay. The last chain was installed back in November, so has lasted just over three months. But it has had a lot of use (and not all on trees!). Wow, just used it for the first time with the new chain. What a difference! I guess the chain dulls over time and you don’t notice how much worse the cutting power is as it happens slowly over a period of time. I shouldn’t have persevered so long before changing it – much quicker and much safer to use. The last of the 4 sheds was demolished today. All of them were of a similar design and having taken 4 of them apart, we are getting quite well-practiced at taking them apart. Take all the glass and metal out of the shed. Take the ridge off the roof. Take the roof off. 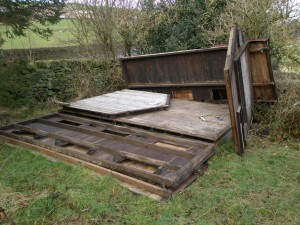 Then the sides of the shed dismantle. Use a chainsaw to cut some of the panels in half, if they are too heavy. 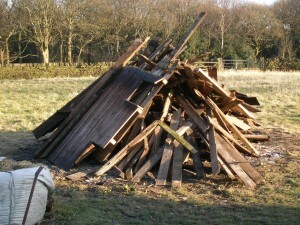 Put all the wood on the bonfire, everything else goes in the skip. Today, it took just three hours to take this one down. Once the shed was gone, we could get to the triangular piece of ground behind the shed – lots of old chicken wire and an old steel bath were waiting to greet us! This little piece of land was dominated by holly and an old rotten alder tree. 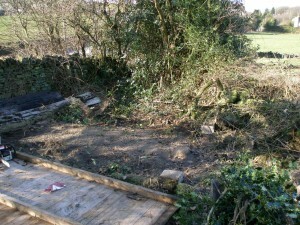 We spent a good couple of hours clearing this area out, but by the end of the day, there was still more to do – probably another 2-3 hours work here to clear out the rest of the undergrowth and reveal what is left of the dry stone wall. This part of the wall should (I say “should”) line up with the other part of the wall that I have been building in the orchard. However, much of this wall was covered with brambles and undergrowth, so when I set up the original line of the wall, there was a little bit of guess-work going on. Once all this undergrowth is cleared away we will be able to see the entire length of the wall and will be able to tell exactly how accurately lined up the new wall is! The 4th and final shed bites the dust. 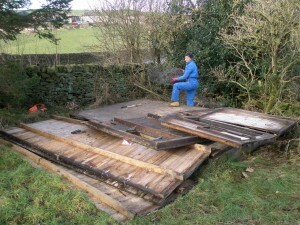 With shed #4 dismantled, we can start on clearing out the rubbish from behind the shed. Now largely cleared out, but still some way to go. I had to sharpen the chainsaw twice during the day!